Pasadena polling places are open from 7 a.m to 8 p.m. NOTE: The following meeting dates, times and agenda items are accurate as of Saturday morning. Click on the appropriate blue headline to ensure the meeting hasn't been cancelled or rescheduled. Suite 101, 150 S. Los Robles Ave. The public is invited to attend the regular WPRA board meetings, held at 6:30 p.m. the first Wednesday of the month (except May, August, and December) in the Westridge School Community Room (unless otherwise noted), 324 Madeline Dr. Park in the State St. lot and walk north across campus to the Community Room. The Recreational Loop will remain open at all times for recreational activity, with the exclusion of bicycles and all vehicle traffic. The Equestrian Trail will remain open at all times. On SUNDAY, NOVEMBER 4, change all clocks back one hour . And check your smoke alarm batteries! To check registration status, click here. FREE FLU VACCINES for those 6 months and older! Pasadena Public Health Department is offering free flu shots November 7 at Pasadena Senior Center, 85 East Holly Street. Pre-registration is required. Call 626-795-4331 to register. Winter watering schedule reminder: From November 1 through March 31 , the winter watering schedule resumes and outdoor watering is only permitted on Saturdays before 9 a.m. and after 6 p.m .
Free rides to vote on election day! Frederick Dock, Director of Transportation is pleased to announce that both Pasadena Transit and Dial-A-Ride are offering free rides on election day! The majority of polling places in Pasadena fall within ¼ mile of a Pasadena transit stop. The public will be notified about this free service via interior posters and audio announcements on buses as well as information posted online and through social media. Join us to celebrate the 27th annual Craftsman Weekend! From November 9th to the 11th, come to the bus and walking tours of historic neighborhoods, join us in receptions in beautiful historic locations and take the Craftsman House Tour featuring Pasadena's best bungalows. 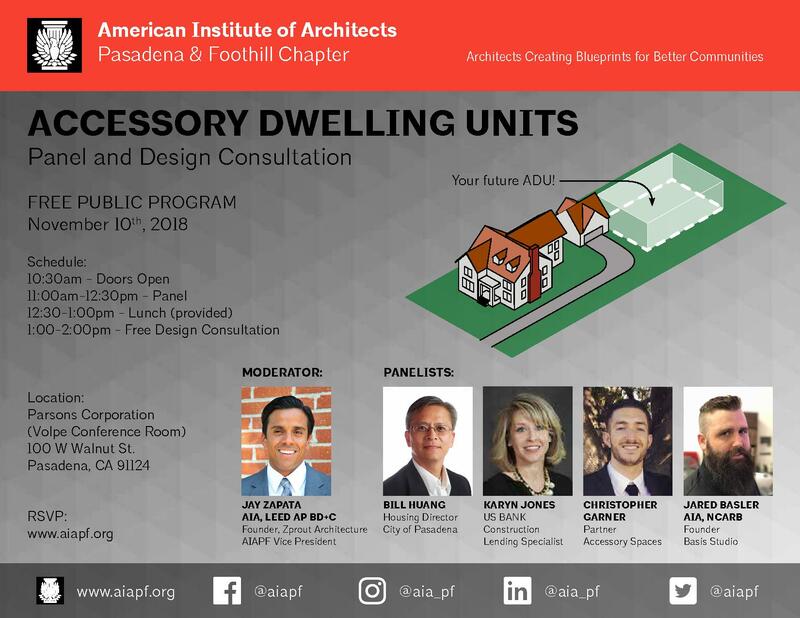 Tickets may be purchased on line or by calling Pasadena Heritage at 626-441-6333 or visiting our office at 651 South St. John Ave.
Accessory Dwelling Units (ADU) event: On November 10, 11 a.m. to 12:30 p.m., the American Institute of Architects Pasadena & Foothill Chapter presents an ADU panel and design consultation at Parsons Corporation, Volpe Conference Room, 100 West Walnut St.
"At their latest regular meeting, the Pasadena City Council approved two very different types of green-related items. First, council approved a set of commercial fees in preparation for the recently-adopted cannabis ballot measures CC and DD, which will go into full effect on Jan. 1, 2019. In a very different form of green-related news, council voted to terminate a 40-year contract with the coal-fired Intermountain Power Project (IPP) plant in Delta, Utah."